Jerry Kustich's "Western box" — he keeps a second "Eastern box" for Great Lakes and striper fishing — is a craftsman's delight, with lessons learned on the water each day often applied to new ties each night. You might think all craftsmen are incessant fiddlers. But as Jerry Kustich’s box showed us, there is no such thing as true innovation without purpose. 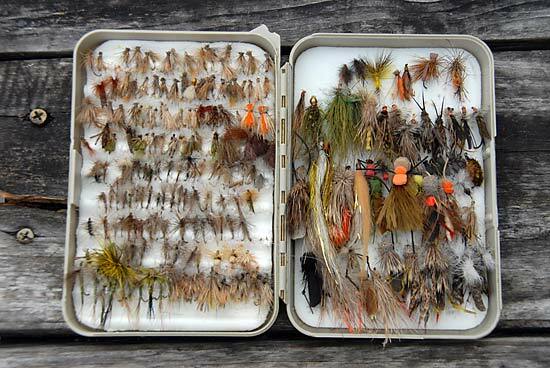 We’ve never seen flies that were so closely matched to presentation strategy, which in Jerry’s case involves using sparsely tied flies with which he can make the fish “comfortable.” The couple of bushy flies in this box were gifts. He calls them Anna Nicole flies: too over-the-top in too many ways. “I THINK this is an old Orvis box but the label is gone and the hinge is almost shot. As I think this box shows, I fish a lot, and people who fish a lot fish with stuff until it’s unusable. And there are lots of flies here, but very few are alike. I’d much rather have 10 different variations on a single pattern than 10 of a pattern I’m convinced will work. 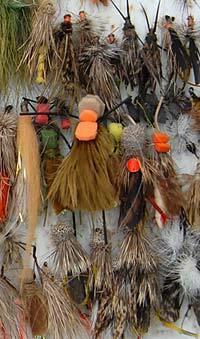 The whole idea of sitting down and tying 3 dozen identical flies just makes me queasy. I watch how the fish react to the slight variations in my flies, then that night I sit down and try something a little different. The next day I can watch the fish respond and get an idea for what I might try next. Besides on any given day there are so many insects and variations on the water, you couldn’t possibly plan for all of them. Sparse flies fit my style of trout fishing, which involves getting the fish comfortable with the fly: casting a bit behind, then short, then a good distance ahead, and then finally timing the presentation with the feeding pattern. I like to throw to the fish when they have just eaten and gone down and left a slight wave in the surface. Together with the sparse dressing, fishing this way actually allows you to see the fish getting comfortable with your fly. You can’t do that with a big bushy fly. It seems to me that a lot of people compensate for their poor approach to the fish with flies that have a lot of razzle-dazzle. Of course whenever possible I fish where I can fine-line dry flies to the fish, and preferably with a dead drift. 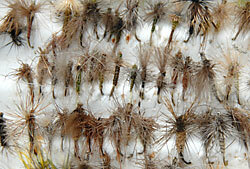 These aren’t the prettiest flies you’ll find, and you wouldn’t be able to buy most of them in a fly shop. A perfect example is the very simple elk hair caddis first tied by Al Troth in Dillon, Montana — you won’t see that pattern in many fly bins, because people won’t buy it. Not only is it tied with few materials, but most folks don’t stay on a river until sundown anymore. My caddis, in the top left rows, are tied mostly in tan and light sedge. Another example is the Cripple. Several years ago, everyone suddenly had to have Cripples in their box. I looked at them and realized that all the flies I tied looked like Cripples anyway. So if you look at the box from top to bottom and left to right, you’ll see lots of caddis dries and emergers, baetis and adams patterns along with a few PMD variations, large and small green drakes, some stimulators, and on the right side a couple of experimental gift flies made of buffalo hair and other materials, several squala stonefly patterns — which I’ll fish on the Bitterroot in late March and early April, a couple of streamers, a couple of ants, and a ton of hopper variations with one of my shop buddy Wayne Maca’s “Serial Killer” patterns in the middle; that fly stands out because it’s got the orange foam patch and is much bigger than most of the other flies. I forgot to mention the three humpies in the second to last row on the left. They were given to me by Florida guide Steve Bailey, and they’re beautiful, but I don’t normally fish humpies because they fall apart after one bite. I like to get a lot of mileage out of my flies. I always have lots of little baetis, BWO and adams variations, and there are usually more lots more parachute ties in here. I like to have lots of PMD variations in my box too, including comparaduns. Lately I’ve been tying my green drakes, both large and small, with extended bodies; it really seems to make a difference. And I don’t fish ants that often, but when I do, I seem to always catch fish, so I always have a few in my box. Finally, I should mention that I usually carry two other small boxes with me, one for Tricos and the other with midges. The Tricos are all size 18: I find that even when the bugs on the water are 22s, I get more response from fish with the larger patterns, maybe because they stand out from the crowd.